There’s nothing quite like Shakespeare in the Park. Aside from the productions themselves, attending a show at The Delacorte is a uniquely New York experience. Especially on a nice summer night, there’s something magical about enjoying theater in the open air, alongside other New Yorkers who have waited on line (either virtually or in person) to get their free tickets. Every time I go it makes me happy to live in this city. The Public Theater frequently puts together a wonderful group of artists to wrap their mouths and bodies around Shakespeare’s brilliant words, and this year’s first production, The Comedy of Errors, is no exception. Thought not quite as star-studded as in year’s past, Modern Family star Jesse Tyler Ferguson and the effortlessly charming Hamish Linklater (who will be seen opposite Robin Williams and Sarah Michelle Gellar in the sitcom The Crazy Ones this fall) are an ideal Dromeo and Antipholus, and Dromeo and Antipholus. (They play both sets of twins who have the same name.) This was my first time seeing a production of the show, but according to a recent New York Times feature, the twins are usually played by two sets of actors. Despite a somewhat clunky final scene, director Daniel Sullivan’s choice to have Ferguson and Linklater play both sets of twins is an ultimately successful choice, and the comedians do a great job of drawing subtle distinctions between the two sets of brothers. Another Sullivan conceit, setting the show in the 1920’s, has its pluses and minuses. The Duke, here an old-timey gangster, brings down the house with his first speech, but having the ensemble swing dance to start the show and then throughout set changes, doesn’t work quite as well. While it adds a jazzy flair to the events, at the early preview I attended the sequences, though stylish, were simply too long, and not quite sharp enough, to add to the proceedings. Ferguson and Linkletter, along with the rest of the cast (Emily Bergl is a standout as Adriana), have a great command of the language, and as a result the story is very easy to comprehend — an underrated virtue in modern Shakespeare productions. They are aided by the fact that, unlike in others of Shakespeare’s comedies, the romantic complications are kept to a relative minimum. (There’s no As You Like It-esque six different couples to follow). At just 90 minutes, there’s something very simple about the show, and the production, making for an enjoyable, though not particularly deep experience. Which is perfectly fine. Aided by the ambience of being in the Park, nature does its part in elevating the experience to magic. 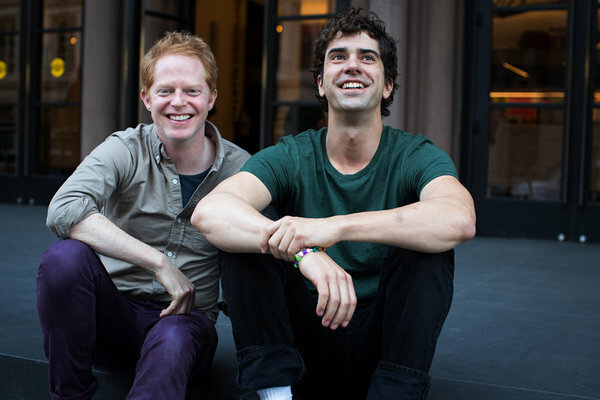 This entry was posted in Theater and tagged Comedy of Errors, Hamish Linklater, Jesse Tyler Ferguson, Public Theater, Shakespeare. Bookmark the permalink.